"Patent licensing company" Lodsys has added Rovio, Electronic Arts, Take-Two, Atari and Square Enix to its ongoing legal action over patent-infringing App Store technology. Wikipedia says, in a properly attributed entry, that a "patent licensing company" is a firm that acquires patents from various sources and then makes money by licensing them to other companies that can actually make use of them. It's not necessarily as leech-like as it sounds, according to Wiki, because it "facilitates access to technology by more efficiently organizing ownership of patent rights," but it still feels a little dodgy to me. In any event, Lodsys is one such company that holds patents on technology that allows free versions of mobile apps to be upgraded to full versions from within the app. Lodsys licensed those patents to Apple but earlier this year launched legal action against seven independent App Store developers for infringing upon them: Combay, Iconfactory, Illusion Labs AB, Shovelmate, Quickoffice, Richard Shindeman and Wulven Games. The company has now expanded that lawsuit to include five more defendants and unlike the first batch, you've probably heard of this new bunch, which includes Angry Birds maker Rovio, Electronic Arts, Take-Two Interactive, Atari and Square Enix. Lodsys had originally demanded .575 percent of the U.S. revenues of all companies involved, but the lawsuit also asks for damages and reparations and seeks to have the infringement declared "willful," which could lead to triple damages. Apple's position on the matter is that its patent license covers all third-party App Store developers as well, while Lodsys maintains that third-party developers are "responsible for securing the rights for their applications" and, obviously, for paying the piper when they fail to do so. And while nobody's going to get rich suing Iconfactory or that Shindeman guy, piling on Rovio, EA and the rest changes that situation considerably. 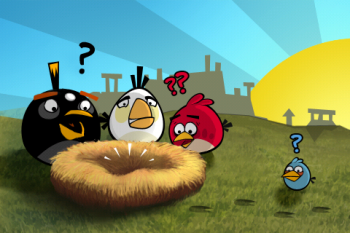 The expanded case also includes at least one Android app, Angry Birds, but Google has not yet commented on the matter.